Your dog is your best friend. That's why he deserves premium nutrition that fuels the extraordinary in him - every day. Eukanuba Adult Food for Large Breeds Rich in Lamb & Rice is the right nutrition for large breed dogs with a sensitive skin and stomachs that want to perform great. The easy to digest ingredients help your dog feel extraordinary. On top of that, prebiotics and beet pulp keep the digestion active and healthy. This premium nutrition contains L-Carnitine to reduce body fat for optimal weight and minimised joint stress, as well as natural sources of Glucosamine and Chondroitin Sulphate to promote cartilage health for healthy joints. Chicken is our primary source of protein to give carnivorous dogs a natural element to their diet. This enables them to build strong, lean muscles and keeps them ready to take on any challenge they meet. Calcium for strong bones and clinically proven antioxidant for strong natural defences keep your dog active and athletic. Since you want your best friend to be great on the inside and look extraordinary on the outside, this adult dog food contains an optimal ratio of omega-6 and -3 fatty acids to promote a healthy skin and radiant coat while they also help to reduce shedding by up to 80%*. 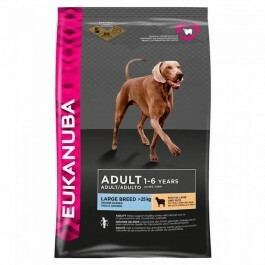 Eukanuba Adult Dog Food for Large Breeds Rich in Lamb & Rice uses 3D DentaDefense technology, which cleans your dog's teeth with every bite, reduces tartar build-up by up to 80%** and helps your dog maintain strong teeth. This large breed food was developed with veterinarians and is recommended by top breeders. It is 100% complete and balanced to make your best friend feel good, even with a sensitive skin and stomach, and to help him go the extra mile with you - every day. Especially large dogs such as German Shepherds, Labradors, Rottweilers and Golden Retrievers with a sensitive skin and stomach have what it takes to perform at their best with Eukanuba's Adult Food for Large Breeds - Lamb & Rice. 1 Agility - Helps support healthy joints with natural source of glucosamine and chondroitin sulphate. 2 Dental - Clinically proven to reduce tartar build-up in 28 days. Reduces plaque and maintains strong teeth. 3 Balance - Promotes optimal digestion with prebiotics and clinically proven beet pulp. 4 Mighty - Helps reduce body fat while preserving lean muscle with L-carnitine. *For dogs <25kg we recommend to feed Adult Small & Medium breed rich in Lamb & Rice.